Bart Ehrman is joining Jonathan Kirsch as a writer whose earlier books I admire and enjoyed but whose more recent works are largely rehashes and (worse) often poorly written and edited. 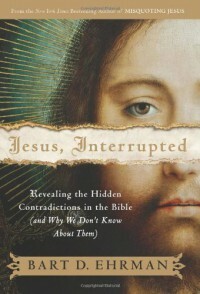 Jesus, Interrupted doesnt' cover any territory not already covered in Ehrman's Misquoting Jesus or Lost Christianities. It also reads like Ehrman threw together his lecture notes - it's repetitive and slapdash. I could envision him using this to good effect in a lecture hall but as a book, the style has serious problems. There are better introductions to critical Bible studies elsewhere (and in Ehrman's own oeuvre mentioned above).